SHENYANG, China — Does excess consumerism represent the measure of a great nation? Or does it portend something darker, a treacherous crack opening in society? 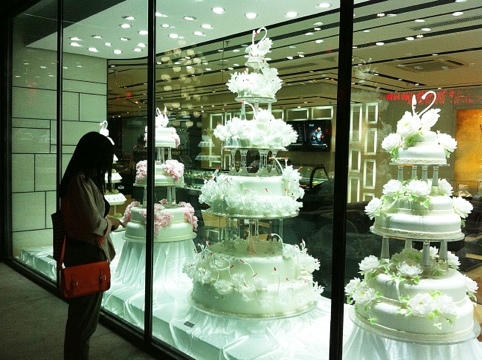 Either way, the wedding cakes for sale at the Black Swan bakery here in Liaoning’s provincial capital are a clear reflection of 1) the astounding wealth some attain in China’s bursting economy, and 2) the indecorous way that the rich communicate their separate stature. The biggest cake, aswirl in swans and blossoms resting on pedestals of cut crystal, sells for 1,999,999 RMB or $317,000 and change. The smaller cake to the left in pix below is 199,999 RMB or $31,745.The cake to the right is 299,999 RMB or $47,618. The clerk says it’s all because of the ingredients.